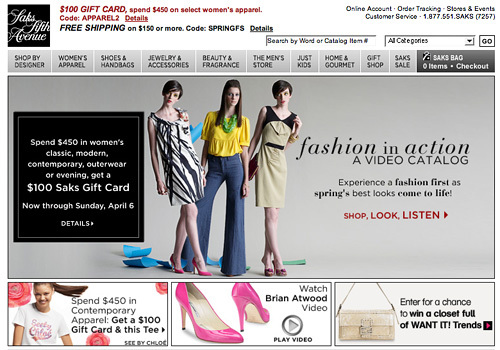 Saks Fifth Avenue is stepping out and debuting “Fashion in Action” – first streaming video fashion catalog. The feature went live last Monday as an effort to combat the deterioration of direct mail catalogs – to make them more entertaining and interactive. So far the virtual catalog is just a test, using items from Saks’ top-selling departments: contemporary ready-to-wear, handbags, and shoes. Some videos also cross-sell jewelry. The videos are short with typical fashion television background music and narration that describes each piece worn by the model. Customers can shop for the entire “look” with one click, where you can see all items shown in the look on one page with details on each. I’ve noticed a trend among fashion retailers towards merchandising entire “looks” – Rampage’s Collections (link removed as page no longer exists) is an example. The benefit of showing sets of items close together is that the customer gets a better idea of how cross-sells actually work with each other. It’s more convincing than trying to visualize how thumbnails of different items would look like together. It’s also more like in-store merchandising. We’re all familiar with mannequins and window displays. Saks doesn’t only put the “looks” together, but on a person (showing the item in context, which will really appeal to the humanistic buyer). With 360 degree views of the clothing, you get an idea of how high or low pants sit on the waist and how long sleeves are. This can also reduce returns when customers have a better idea of what they’re buying than from just a flat image. Fashion magazines have always shown clothing on people and listed where to buy items, but Saks’ fashion shows take you right to the products – eliminating the hassle of shopping at separate stores. This actually is far more practical than magazines. I wouldn’t be surprised if we start to see editorial fashion shoots in video form on magazine websites soon. The products could be sold together right on the magazine’s website even if the items come from different stores through an affiliate arrangement. I’ve been blogging much about the use of video merchandising lately. (Examples: Rampage, American Eagle Outfitters and Vitaman) Certainly because this type of thing takes a lot of design and development resources, etailers want to know if there’s a payoff. Let’s let the large retailers test the waters for us and see how it pans out. But I think this is a natural progression for ecommerce and we will see more and more innovations with the medium. Webinar Recap: Effective Merchandising: What Sells?